'White henna' is not henna. 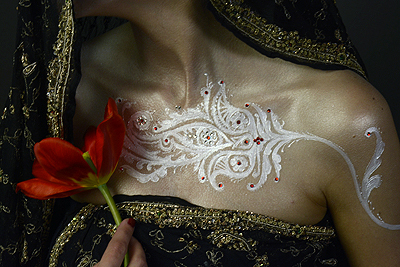 'White henna' can be created safely with materials including Temptu temporary tattoo paint, Becoming Moonlight® gilding paste, Becoming Moonlight® gilding powder, Becoming Moonlight® glitter and Becoming Moonlight® gems. These materials have been formulated to all work together successfully to extend artists' imaginations and techniques. These 'white henna' materials are waterproof, absolutely safe for use on skin, and last from three to ten days. 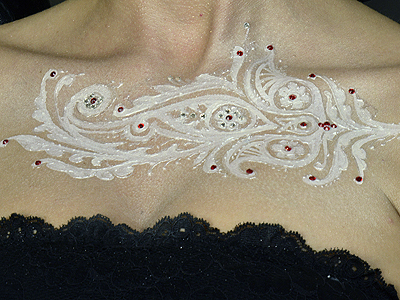 Apply a pattern with Temptu temporary tattoo paint, Becoming Moonlight® gilding powder and Becoming Moonlight® gilding paste and gems as seen in White Henna 'How-To 2' . Apply Becoming Moonlight® gilding paste (frequently referred to as 'white henna' to as you would henna, but use much finer lines, as seen in 'White Henna' 'How-to' 1 . Use the gilding paste to define and enhance your Temptu pattern. Lines the size of a cat's whisker will dry quickly. Thick lines dry very slowly. Allow the 'white henna' paste to dry for about ten minutes. Touch the 'white henna' paste gently, to see if it is no longer wet and sticky, and has become somwhat firm and tacky. Becoming Moonlight® paste will not dry transparent, it will bbe translucent or white. This is convenient for artists who need to see where they've been working. Pros-Aide Cream Adhesive will dry completely transparent. It is necessary to use gilding powder or glitter to seal Temptu and 'white henna' paste or they will remain sticky and collect dust and crud. If the 'white henna' paste catches the bristles of the brush, the paste has not dried enough. Wait a few more minutes and try again. 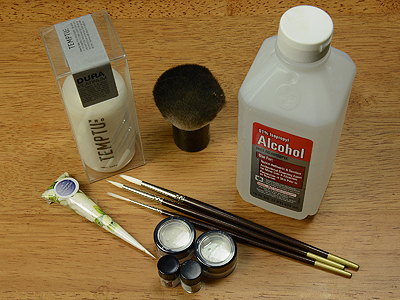 If your brush is sticky with 'white henna' gilding paste, clean the brush with 91% isopropyl alcohol and dry it thoroughly. Apply mica powder or glitter generously over the 'white henna' paste. Load the brush with powder, and brush it gently over the surface of the 'white henna' paste. Once you have applied gilding powder, brush way the excess. Use a large, soft brush to disperse the powder. If there is still excess powder clinging to the skin, rinse the area gently with water, and pat dry. When you have sealed your Becoming Moonlight® gilding paste and Temptu, the pattern is finished! This work will last from three to ten days, depending on care. This body art will be durable and waterproof. Bathing and showering will not disturb the design, though you should not scrub or rub the design. If you need to remove the design, rub it with the sticky side of scotch tape, and rub the remaing bits off with lotion.